Today I am privileged to provide you with a guest post by Fantasy/Sci Fi author Terry W. Ervin II. Having recently published the third book in his First Civilizations Legacy Series, Terry shares with us what he has learned in writing Soul Forge. I hope you enjoy reading his wise words and take as much away from them as I did. From the first page of a first draft, of the first novel an author writes, to writing ‘The End’ for the final draft of that first novel, the author has probably learned quite a bit about writing—even if that first novel isn’t quite good enough to find a publisher (or of sufficient quality to merit self-publication). Heck, most writers, upon completing their first novel’s first draft, can see a major improvement in writing and storytelling skill when comparing the early chapters to the later ones. While there is a learning curve, where writers learn a lot (or hopefully do) during their early efforts, established authors also learn something—maybe many somethings—during the process of completing each project. Perhaps it’s how to employ a new structure, such as creating a frame story, or figuring out how to write using a different point of view. Sometimes it’s not learning something new, but improving upon an already existing skill or a familiar technique, such as more effective use of foreshadowing or devising how to make an action scene flow just a little bit better. For me, all of this comes from actually writing and by comparing what I’ve written with what I learn through reading and studying other authors’ works. I also learn from beta reader and crit partner comments, and from working with an editor. This type of learning requires an open mind coupled with the drive to create a story that’s better than the previous one. Soul Forge, my forth published novel, is my most recent release. And, through the process of writing it, I believe I made significant strides in improving my writing in several areas. 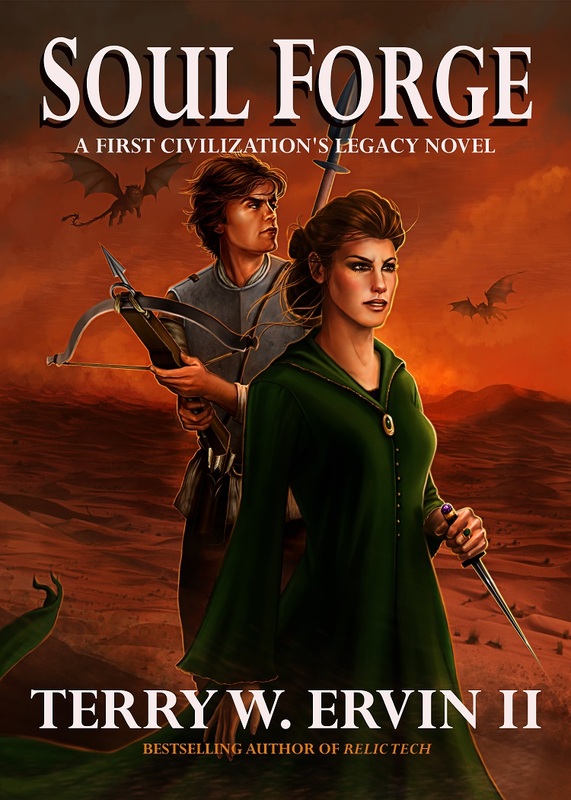 Soul Forge is the third novel in the First Civilization’s Legacy Series. The stories are mainly action-adventure and focus on Flank Hawk, a farmhand turned mercenary in a post-apocalyptic fantasy setting. The first and probably the most important thing I learned was how to write the third novel in a series such that readers could pick up Soul Forge and enjoy it as much as anyone who’d read Flank Hawk and/or Blood Sword, the first two novels in the series. Through reading and study, I’d learned how to write Blood Sword, so that readers could select it as the first novel in the series they might read. But that was the second novel in the series. Soul Forge, being the third, added a greater level of complexity to accomplish the same objective. The world in the series is extensive, with countries and cultures and history and conflicts that are built upon while being integral to the plots of each novel, beginning with Flank Hawk and moving forward. Add to that, the characters which appeared earlier in the series, and return to play a part in the third. There are even characters that died in the earlier novels, but continue to impact the characters and their actions in Soul Forge, and will continue to do so as the series continues. I refined the use of dialogue, description, character thoughts, flashbacks, and character actions/responses to provide the necessary backstory within the context of the current story being told. It’s accomplished in such a way that it isn’t redundant, and actually reminds veteran readers of what’s happened in the series while providing additional information or insight. Second, all of the novels in the First Civilization’s Legacy Series are written in first person point of view. Even so, characters other than the POV character (Krish/Flank Hawk) are well developed, with a number becoming the favorites of readers. In Soul Forge I worked to improve using actions, dialogue, and POV character thoughts and perception to more fully bring the characters that populate the novel to life. Finally, I worked to improve my ability to intertwine secondary plotlines with the novel’s main plot to add depth of interest and suspense for the reader while raising the stakes for the characters involved. An example of this was the personal duel brought upon Mercenary Flank Hawk and, although delayed until young Enchantress Thereese is revived (or dead), it’s a challenge the mercenary knows he cannot win. Even Imperial Seer Lochelle predicted that, should he cross blades with Flayzin, the captain of Supreme Enchantress Thulease’s guard, Flank Hawk will die. Complicating the situation is the source of the conflict (the death of a prince) and the fact that both Flank Hawk and Captain Flayzin serve Supreme Enchantress Thulease. The two men must set aside their conflict as best they can while accompanying the enchantress as she seeks the legendary Sleeping Sage in a bid to discover a way to revive her dying daughter. Why would Flank Hawk accompany the supreme enchantress, through perilous circumstances and fighting alongside Captain Flayzin, knowing that the man’s sword is destined to slay him? That concern and many others are brought together as the story moves forward, aboard the Hunchback Maiden while crossing the Mediterranean, traversing the vast desert of the Southern Continent, and even venturing to the Mountainhold of the secretive Svartálfar. Even as I write this article, my mind is on my next project (working title: Relic Rescue), the sequel to Relic Tech, the first novel in the Crax War Chronicles. While I’ll be using what I learned while writing Soul Forge and the other novels that came before, I’m sure I’ll improve not only in several areas of writing, but learn something new. Or at least I hope so. Terry W. Ervin II is an English teacher who enjoys writing fantasy and science fiction. His First Civilization’s Legacy Series includes FLANK HAWK, BLOOD SWORD and SOUL FORGE, his newest release from Gryphonwood Press. 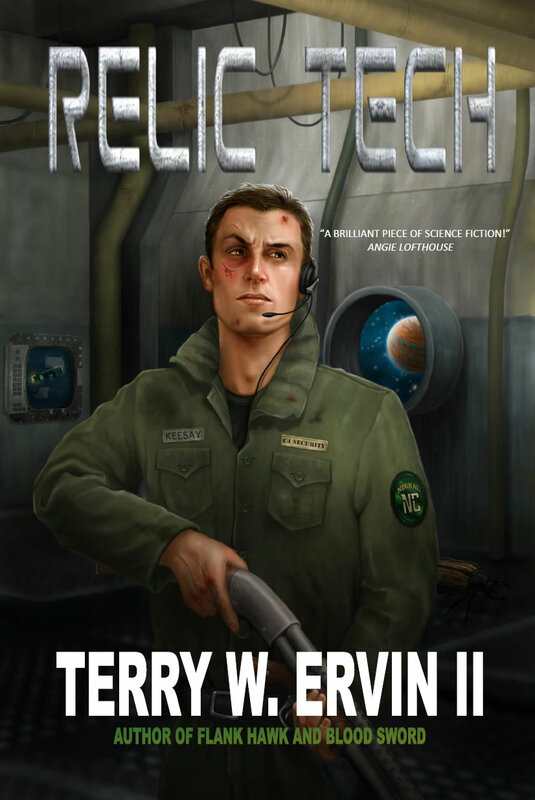 Terry’s debut science fiction novel RELIC TECH is the first in the Crax War Chronicles and his short stories have appeared in over a dozen anthologies and magazines. The genres range from SF and mystery to horror and inspirational. GENRE SHOTGUN is a collection containing all of his previously published short stories. This entry was posted in Writing and tagged books, Fantasy, Publishing, science fiction, Soul Forge, Terry W Ervin II, Writers Resources, Writing by blottingaway. Bookmark the permalink. Thank you for posting my article for your readers.